Using pottery pieces and making the tile yourself is doable and it can make a great unique kitchen backsplash. Since it sounds like you are apprehensive about starting this type of backsplash project, I suggest practicing first before taking this into full-on backsplash mode. Go to your local hardware store and get a board or square of drywall, tile adhesive that sticks to the surface you are practicing on and tile grout. Next go get a few pieces of pottery to smash up! Once you’re done with the fun part and your pottery has been smashed to pieces you are ready to begin. Plan out your design first and then glue the pottery pieces to the board. As soon as it has had the appropriate time to set up, grout in between the pottery pieces. Now step back and look over your work. If you’ve used similar colors to what you want to put in your kitchen take the board and prop it against the wall so you can see the effect in the space you want to use it. Another important thing to consider is how that sample looks with your countertop specifically, since the backsplash will be touching it. If your countertop is granite or something like granite that has a busy pattern to it, you may want to use larger pieces of pottery. Otherwise your backsplash could look too busy with pottery pieces and grout lines and that might compete with your countertop. 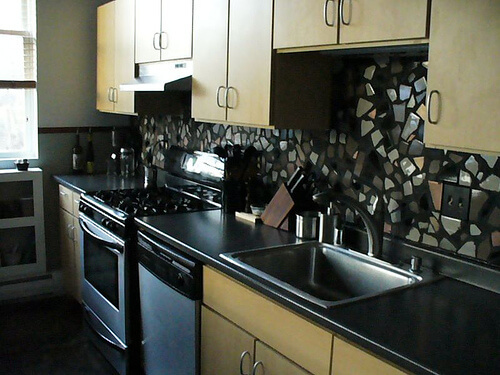 Don’t forget, this type of backsplash can be as expensive or inexpensive as you want. You get to choose the colors and textures you want, for an inexpensive way to go, look at thrift shops and bargain stores. Or instead, combine showcase pieces with the thrift store ones. There is no wrong or right way to go about choosing the pottery to make into pieces for your backsplash. So you see this project is do-able as long as you do your homework first. You can have a unique kitchen backsplash and you can do it yourself. Just make sure you give yourself the time to practice and really consider whether the look is right for your kitchen backsplash and your budget!